While it is easy to get sucked into the glamour of large, expensive diamonds, few of us can afford to buy those big baubles. The easiest way is to avoid the thought from the beginning, but if you’ve gone down that road (or even if you haven’t) there are several methods for matching a limited budget to the cost. 1. Make the jewelry “something borrowed.” One way to slash bridal jewelry from the budget is to borrow it. If someone you know already owns a piece you love and if works with your wedding dress and hairstyle, borrow it to wear on your big day. 2. Wear an heirloom. Another no-cost solution is to wear an heirloom piece from a family member as the “something old” in your wedding. 3. DIY. For those of you with talent and fine motor skills (or those of you who know someone who has them), making your own jewelry is an option. You can buy findings, beads, and other supplies at craft stores, fabric stores, eBay, and online specialty merchants. Be sure to leave enough time to practice and experiment. (5) From the start look at only inexpensive jewelry–skip the upscale pearls, diamonds, 24K gold, and platinum completely. Instead, hone in on jewelry made from more affordable materials such as: freshwater or man-made pearls; imperfect diamonds, cubic zirconium (which generally look much better than low-grade diamonds), crystals, or affordable gemstones; and silver, 10K-14K gold, titanium, or tungsten. (6) Figure out what about it you like, then look for more affordable pieces with similar features. Get as an early wedding gift. Just like anything else related to your wedding, you can ask for jewelry as an early wedding gift. You can also help the bridesmaids save by giving them their jewelry ensembles as a gift. 7. Rent. If you simply cannot seem to be satisfied with the look of jewelry within your budget, think about renting expensive pieces. It is a way to wear red carpet quality at sidewalk sale prices. There are several companies (both online and “brick and mortar”) that make it possible to rent items retailing for hundreds to tens of thousands of dollars for a fraction the cost. Search for rent wedding jewelry in any search engine to find online options. Or, to find local sources, conduct the same search followed by your city and state. 8. Get as an early wedding gift. 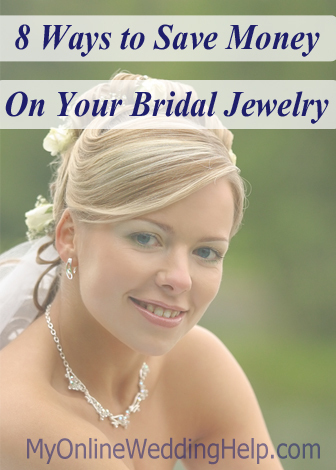 Just like anything else related to your wedding, you can ask for jewelry as a gift.